Liverpool boss Jurgen Klopp said it was "nice to write a piece of history" as the Reds thrashed Slovenian side Maribor to record the biggest away win by an English team in the history of the European Cup. The Reds dominated throughout to go top of Champions League Group E with a scintillating performance. Roberto Firmino and Mohamed Salah both scored twice, with Philippe Coutinho, Alex Oxlade-Chamberlain and Trent Alexander-Arnold also on target. The win eclipses 6-0 away victories by Leeds United over Norwegians Lyn in October 1969, and Manchester United against Irish outfit Shamrock Rovers in September 1957. "I was told about the record after the game and I didn't know," said Klopp. "The wonderful history of this club can feel like a backpack at times so it is nice to write our own good piece of the history. "It will be difficult to beat that record. It is quite rare to win 7-0 but it showed we did unbelievably well." Liverpool opened the scoring on four minutes when Firmino finished from close range after Salah broke free down the right. Coutinho made it 2-0 with a half-volley from James Milner's pull-back before Salah scored twice, finishing off passes from Firmino then Alberto Moreno as the Reds led 4-0 at half-time. Firmino added a fifth with a flicked header from Coutinho's free-kick as the Reds claimed their biggest Champions League victory since an 8-0 home victory over Turkish side Besiktas on 6 November 2007. Daniel Sturridge linked up with fellow substitute Oxlade-Chamberlain for the latter to score his first goal for the club to make it 6-0, and Alexander-Arnold sealed the rout with a deflected 30-yard strike. Liverpool had started their Champions League campaign with two draws - 2-2 at home against Sevilla and 1-1 at Spartak Moscow - but they never looked in danger of dropping points against a side second in Slovenia's First League. Leading 2-0 after 13 minutes, it became a question of how many Liverpool would score against woefully outclassed opposition, and the Reds did not disappoint as they produced a wonderful, free-flowing performance. These two teams meet again in two weeks, and the Reds will be confident of another easy win at Anfield. Halfway through the group phase, Liverpool are top, level on points with Spartak Moscow, who defeated previous leaders Sevilla 5-1. Klopp's side had won only one of their past eight matches in all competitions before this confidence-building performance, and the German was able to give some of his squad players playing time in the second half. Perhaps with one eye on the Reds' match at third-placed Tottenham on Sunday, Salah, Firmino and Georginio Wijnaldum were withdrawn in the second half to give Oxlade-Chamberlain, Sturridge and 20-year-old Dominic Solanke chances to impress. Late on, Sturridge released Oxlade-Chamberlain and the England midfielder slotted past Jasmin Handanovic for his first goal since his £35m move from Arsenal at the end of August. There was still time for Alexander-Arnold to score only his second Liverpool goal with a deflected strike from long range to seal a perfect night for the visitors. Their defence, which has conceded 12 goals in eight Premier League games, has been heavily criticised this season, but this result means they have kept back-to-back clean sheets after a goalless draw against Manchester United on Saturday. 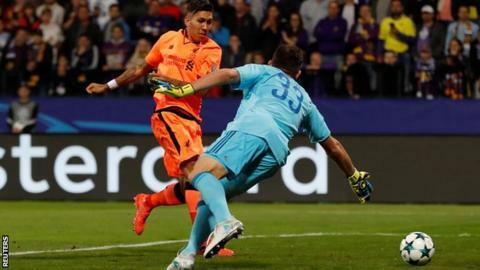 Klopp maintained his policy of rotating his goalkeepers for Champions League matches, and Loris Karius comfortably saved a low shot from Mitja Viler before Marko Suler headed Maribor's only other chance wide. Maribor, who have never won a home Champions League match, are bottom of the group with one point from three matches. In the eight Champions League matches on Tuesday, Liverpool were the only side not to concede a goal. This win was the biggest margin of victory for an English club away from home in the European Cup/Champions League, overtaking Lyn 0-6 Leeds United in October 1969 and Shamrock Rovers 0-6 Manchester United in September 1957. This is the biggest away win by an English club away from home in European competition since Arsenal defeated Standard Liege 7-0 in the Cup Winners' Cup in November 1993. Maribor have won only one of their 15 games in the Champions League group stages (drew five, lost nine) - a 1-0 victory over Dynamo Kiev in September 1999. This is Liverpool's 10th Champions League campaign, and only their second appearance in the group stages in the past eight seasons. They have not reached the knockout stage of the competition since 2008-09. Liverpool had won only one of their past eight away games in the Champions League before this match (drew four, lost three). The previous victory was a 1-0 success against Hungarian side Debrecen in November 2009. Liverpool have scored ten goals in the Champions League this season; seven of which have arrived in the first half of matches. Roberto Firmino's opening goal (three minutes, 14 seconds) was the earliest that Liverpool have scored in the Champions League since December 2007; Steven Gerrard's goal versus Marseille (3:12). This was only the seventh occasion that an English club had scored four first-half goals in a Champions League game. Alex Oxlade-Chamberlain told BT Sport: "We started with the right intensity, the manager said it would be a tough game and we couldn't be complacent. "Even at half-time he was pushing for us to do better and we got everything we deserved. "We were very clinical and putting almost all of our chances away. It feels like we have a lot of goals in us, we create a lot of chances. "This is a competitive team, we have had a few results that have not gone our way and I'm ready whenever I get an opportunity." Liverpool boss Jurgen Klopp told BT Sport: "Our attitude was outstanding - we were spot on from the first second. "We scored wonderful goals, played wonderful football and it looked like they were not very good but is difficult to play against us. I love the fact we stayed really concentrated in the second half, we controlled the game and it was a very mature performance. "You can struggle in a game like this if you do not have a 100% attitude, it was very mature. Seven goals was wonderful, but the counter pressing I was close to celebrating it, it was so good. They are a really good football team and they could not cope with this. "All over, it was a really nice performance." Liverpool play in the Premier League at Wembley Stadium against Tottenham on Sunday, 22 October (16:00 BST), before a home game against Huddersfield on Saturday, 28 October (15:00 BST). Liverpool and Maribor then play at Anfield in the next round of Champions League matches on Wednesday, 1 November (19:45 BST). Match ends, Maribor 0, Liverpool 7. Second Half ends, Maribor 0, Liverpool 7. Jasmin Mesanovic (Maribor) wins a free kick in the defensive half. Goal! Maribor 0, Liverpool 7. Trent Alexander-Arnold (Liverpool) right footed shot from outside the box to the bottom right corner. Assisted by Philippe Coutinho. Dino Hotic (Maribor) is shown the yellow card for a bad foul. Foul by Dino Hotic (Maribor). Offside, Liverpool. Alex Oxlade-Chamberlain tries a through ball, but Daniel Sturridge is caught offside. Goal! Maribor 0, Liverpool 6. Alex Oxlade-Chamberlain (Liverpool) right footed shot from the centre of the box to the bottom right corner. Assisted by Daniel Sturridge with a through ball. Attempt missed. Alberto Moreno (Liverpool) left footed shot from the left side of the box is too high. Assisted by Philippe Coutinho. Trent Alexander-Arnold (Liverpool) wins a free kick on the right wing. Foul by Mitja Viler (Maribor). Substitution, Maribor. Jasmin Mesanovic replaces Damjan Bohar. Blaz Vrhovec (Maribor) is shown the yellow card for a bad foul. Philippe Coutinho (Liverpool) wins a free kick in the attacking half. Foul by Blaz Vrhovec (Maribor). Attempt blocked. Dominic Solanke (Liverpool) right footed shot from outside the box is blocked. Assisted by James Milner with a cross. Corner, Liverpool. Conceded by Jasmin Handanovic. Attempt saved. Alex Oxlade-Chamberlain (Liverpool) right footed shot from the right side of the box is saved in the bottom right corner. Substitution, Liverpool. Dominic Solanke replaces Georginio Wijnaldum. Damjan Bohar (Maribor) wins a free kick in the defensive half. Damjan Bohar (Maribor) wins a free kick in the attacking half. Corner, Liverpool. Conceded by Marko Suler. Daniel Sturridge (Liverpool) wins a free kick on the right wing. Foul by Marko Suler (Maribor). Offside, Maribor. Damjan Bohar tries a through ball, but Mitja Viler is caught offside. Foul by Alex Oxlade-Chamberlain (Liverpool). Marko Suler (Maribor) wins a free kick in the defensive half. Dino Hotic (Maribor) wins a free kick on the right wing. Substitution, Maribor. Aleks Pihler replaces Valon Ahmedi. Substitution, Maribor. Dino Hotic replaces Martin Kramaric. Attempt missed. Alex Oxlade-Chamberlain (Liverpool) right footed shot from the centre of the box is high and wide to the right. Assisted by Alberto Moreno with a cross following a corner. Substitution, Liverpool. Alex Oxlade-Chamberlain replaces Mohamed Salah. Corner, Liverpool. Conceded by Blaz Vrhovec. Attempt blocked. Philippe Coutinho (Liverpool) right footed shot from outside the box is blocked. Assisted by Georginio Wijnaldum.